Recently, Ukraine has set an ambitious goal – to build a Hyperloop superspeed transport system in the country. In the future, passengers can travel only 30 minutes from Kyiv to Odesa at a distance of almost 480 km. 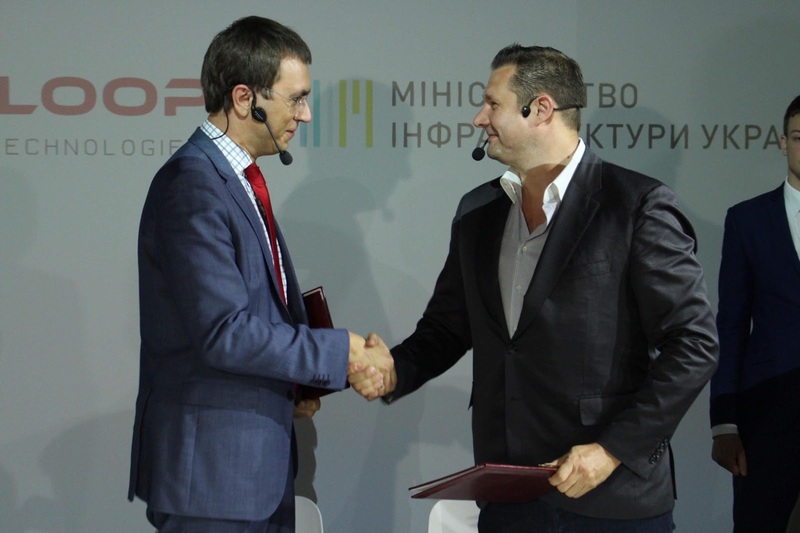 On 14 June Ukrainian Minister of Infrastructure Volodymyr Omelian and CEO of Hyperloop Transportation Technologies Dirk Ahlborn signed a memorandum of understanding and cooperation on the Hyperloop project. The agreement foresees the joint development of technologies, as well as a joint search for investors for the project. Since the project hasn’t yet been backed by investors, the question arises whether the Ukrainian Hyperloop is a futuristic dream or the near future. Hyperloop is a project of a vacuum train which can reach the speed up to 1,200 km per hour. The century-old idea of a traveling through evacuated tubes was first supported by the CEO of SpaceX and Tesla Elon Musk in 2012. The Hyperloop Alpha concept emerged in August 2013. So far two key rivals, Hyperloop Transportation Technologies (HTT) and Virgin Hyperloop One, compete to deliver the system to the world. The high speed of hyperloop is supposed to be reached due to reduced air pressure (vacuum) inside the sealed pipes. Tracks for hyperloop will be built above the ground and equipped with solar batteries to power the system. The electric magnets and turbines mounted on sealed capsules are to make the transport moving in the vacuum environment. The first international tests of the Hyperloop transport capsules kicked off in 2015. The first public open-air testing took place in Nevada Desert, US, in May 2016 by the Virgin Hyperloop One. A capsule accelerated to 186,7 km/h in 1.1 seconds, having traveled more than 100 meters. In April 2017 the company finished constructing of a 500-meter test route in the Nevada Desert, called DevLoop. “I’m entirely convinced we’ll be seeing freight moved in a Hyperloop by 2020, maybe 2019, and our first passengers by 2021,” said CEO of Hyperloop One Rob Lloyd in an interview with Engadget. What countries are already involved in Hyperloop projects? The United Arab Emirates signed an agreement to build a 10-kilometer Hyperloop tube system in the territory of the country. “This agreement creates the basis for the first commercial Hyperloop system in the world here in the Emirates, with the goal of eventually connecting Abu Dhabi to Al Ain, Dubai, and Riyadh, Saudi Arabia,” said Chairman of HyperloopTT Bibop Gresta. The world’s first commercial use of the system is expected in 2020. The first European Hyperloop prototype track has been under construction in France. The first stage of the project will introduce a 320-meter-long line. According to the HyperloopTT, the tube will become operational later in 2018. The anticipated date of completion of the second stage is 2019, the track will extend the line to a full-scale one-kilometer-long system. All in all, the HyperloopTT has signed agreements in the United States, Slovakia, United Arab Emirates, the Czech Republic, France, India, Indonesia, Brazil, and Korea. Virgin Hyperloop One is going to build a Hyperloop demo track in India. In February, the company and the government of the Western-Indian state of Maharashtra signed a memorandum of understanding. Hyperloop may connect central Pune, Navi Mumbai International Airport, and the city of Mumbai in 25 minutes (the distance of about 150km). It is expected to be operational by 2024. And now let’s take a look at the agreement which has been reached in Ukraine. After the Ukrainian Infrastructure Ministry and the Hyperloop TT agreed on the cooperation. Minister Omelian hopes that a joint research and development center will be created in the city of Kyiv or Dnipro. The Center will deal not only with the Hyperloop technology development but also with testing new materials and components for modern transport systems. The first tests of the tube track are planned for 2019. “Everything will depend on our cooperation with the HTT. If it will be viable to conduct testing on the existing platform in Toulouse (France) and to build, say, Hyperloop 2.0 in Ukraine, we will follow this way. Everything depends on how cost-effective it will be,” said Omelian. The Minister hopes to launch the first Ukrainian commercial Hyperloop system during the next five years. “The first commercial Hyperloop line may be launched in the UAE. I want Ukraine to end up with at least one Hyperloop link in the upcoming five years. It will be the right thing to hold talks with partners in China and the European Union to connect freight shipments from China with the EU countries via Hyperloop,” told Omelian. Earlier in February 2018, the Ministry of Infrastructure announced a test platform of Hyperloop in Dnipro in partnership with the Оctagonal Corporation. There is no particular information about the investors of the Hyperloop system in Ukraine except the fact that the Hyperloop TT and Ukrainian Government are going to search them together. Ahlborn assumes that there also will be a state support for it. Previously, the construction of a one-kilometer stretch of the Hyperloop track cost around $20 million. However, the CEO avoided estimations for the Ukrainian project because no research on the issue has been yet done. The expected term of recoupment of a commercial Hyperloop track is 8-12 years. “Taking into consideration the peculiarity of the technology, it doesn’t need much energy and, conversely, produces it. The energy from alternative sources may power it, which will be located along the route of the capsule,” told Ahlborn to Yevropeyska Pravda. Mr. Ahlborn also noted that an average price of a Hyperloop ticket is comparable to the one for the same-distance bus trip, according to a company’s earlier research in other countries.